Added by Bill Bowman on March 27, 2017. 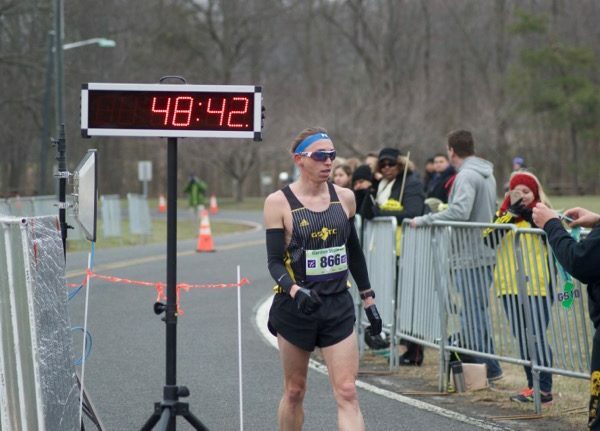 Joshua Izewski of Doylestown, Pa. crosses the finish line March 26 in the inaugural Garden State 10-Miler. The inaugural Garden State 10-Miler race was a family affair, in more ways than one. Sure, there were members of the same family signed up to run the 5K, 10-mile and half-marathon challenge races. But the race itself only came about because of the work of two relatives, both with connections to Franklin Township. 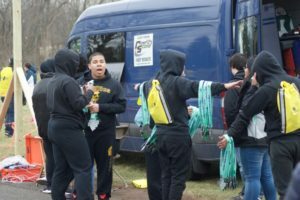 The race, which drew hundreds of runners to Colonial Park on a cold, windy March 26, was sponsored by the Garden State Track Club. The club’s president is Chuck Schneekloth, a new township resident and the literacy coach at Franklin Middle School. Schneekloth said his club identified a need for a marathon tuneup race for the state’s many marathon runners, in advance of the spring running season. The Boston Marathon is set for April 17, and there are a number of other races during the season. Schneekloth approached his cousin, Robert Brown, a township police officer, to see if there were any police-related charities that might benefit from a race event. We do, Brown told him, the Nick Magos Cancer Callout. The charity benefits family members of Somerset County SWAT Team members who are battling cancer and other life-threatening illnesses. “It came to my mind automatically,” Brown said. Schneekloth said there were about 950 registrations. Dozens of township residents were among the runners. Also helping out for the day were about 60 volunteers from Franklin High School, mostly from the Army Junior ROTC. He said the goal is to turn the race into an annual event. Brown is a runner, but he did not sign up for the inaugural race. “But I plan to run the route next week, just to say I did it,” he said. Also running the race was former Mayor Chris Kelly, who is a triathlete. Kelly was running with some fellow cancer survivors. Kelly finished the 10-mile race 88th out of 535 runners, with a time of 1:13:32. The 10-miler winner, Joshua Izewski of Doylestown, Pa., finished with a time of 48:41.89, a full four minutes ahead of the second-place finisher, Aaron Leskow, of Toms River, who clocked in at 52:47.45.